In North Carolina, residents must register their vehicles with the Division of Motor Vehicles. Any new car or out-of-state vehicle must obtain plates for North Carolina within 30 days. There are various plates issued such as disability, specialty, standard, and personalized license plates. Residents in North Carolina must register their vehicles with the Department of Motor Vehicles (DMV). Those registering their vehicle with the DMV will be issued a standard set of plates for cars, vans, trucks or a single plate for motorcycles and trailers. It is possible to obtain specialty plates which has a unique design of a charity, organization, occupation, or cause. There are certain requirements and additional fees included with the license plates. Most license plates available in North Carolina can be personalized with a unique plate number. New residents have 30 days to register their out-of-state vehicle. If purchasing a vehicle from a dealership, it is possible that the dealership will assist with the registration of the vehicle. They will provide temporary plates which allow vehicle owners to drive legally while their registration is processed. When buying a vehicle from a private seller, it is mandatory to obtain temporary plates from the DMV or local dealership. Temporary plates are valid for 30 days and cannot be renewed. The following is reveals only a few examples of the specialty plates available in North Carolina. Contact a North Carolina DMV for more information about speciality plates, pricing, and eligibility. Registering and renewing specialty license plates cost $30. Available plate numbers should be checked in advance before applying. It is possible to transfer license plates from a previous vehicle to a new vehicle only if the vehicle is registered in the same name. It is not possible to transfer license plates to the individual purchasing a vehicle from another person. If license plates are lost, stolen or damaged they must be replaced from the DMV immediately. Although a police report is not required if license plates in North Carolina are stolen, filing a police report helps to prevent their abuse and misuse. License plates can be surrendered either in person or mailed to a DMV office. Upon receiving new decals, they can be placed over the old decals. Vehicles should be renewed prior to their expiration to avoid any late fees. Available license plate numbers can be found using the search engine above. 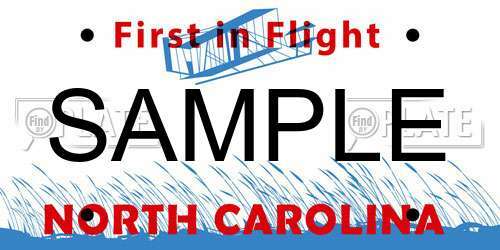 Simply enter the plate number for the state of North Carolina and the results will reveal whether a plate is available or not. FindByPlate can also be used to obtain some historic and background information about the vehicle registered to a license plate.